There is something that people are not telling you. There is something about which people are not thinking. It is something that is about to happen. It is in regards to America’s future. In regards to America’s future something is being overlooked; something that will affect everyone. It is something important to the future outcome of this country that is being overlooked. The military planners have not thought of it. The leaders in government have ignored it. The average citizen has forgotten it. The United States of America has forgotten to consider what God will do in response to a people that has rejected him and has selfishly set out on its own course that includes cruelty to and the oppression of others. Yet the Bible has made it very plain concerning what God will do. Tens of thousands or more of refugees are streaming away from the front lines because of a new push by enemy forces, adding to the vast number of already homeless civilians. Officials reported that a great number of refugees are already believed to be huddled in open air, makeshift camps, and are in grave danger of mass starvation unless food drops are commenced immediately. The lack of shelter is promoting the spread of typhoid, cholera, and pulmonary infection. Widespread atrocities were also reported by many refugees who had fled their homes from the intense shelling. Of what is this a description? Is it of the terrible Balkan conflicts of the 1990’s? No, it is not. It is a description of America. It is a description of how God will punish America: America will be against all flags. What is meant by the expression, “Against all flags”? This is a metaphor that means, for instance, that one lone warship will fight against those from all other nations. According to this booklet it means that in a great war in the future, the lone land of America will be pitted against the rest of the world. It means that all of the world united will assemble their combined military might, point it at the United States, and send it against these shores. In a fury, foreign armies will sweep across this land. From sea to shining sea a wave of destruction will storm this country. Whether America will be annihilated, or whether it will survive. The Nature of this War. What will be the nature of this war? Be clear about this! Not by missiles raining down, nor by a nuclear fire sweeping across it, rather by hordes of armed men marching by land, and sailing by sea from Europe, Asia, and Africa, will this country be destroyed. Not a few, but vast armies will devastate America. They will burn it and destroy the cities and the towns all across this land. Not a few, but millions of our citizens will be caught up in combat. Are you concerned? Do you want America to survive? Then, listen! Hear the hard facts! Learn the truth that every citizen could and should know! Listen to what will happen! Do what God wants you to do! Save this Republic! In what way will this War happen? Will other nations be the cause of this war? Learn that America itself will be the cause. How could I possibly know this? How could I be able to tell that a war will be coming, and that the United States itself will be the cause of it? It is simple. In fact, it is most certain and dependable. It will be for the following reasons. Listen to them, America! Wake up out of your sleep, citizens! Stand before your God, and be judged! This war will be a punishment. Who will punish? The Almighty will punish. Because of America’s sins, God will keep his promise to punish with a great war. Know that the Almighty punishes a country for its unbelief of him. Whenever a country chooses other objects to serve and to love more than him, God threatens with war. Listen to his promise, and make no mistake about it, “They chose new gods, then there was war” (Judges 5:8)! “The Lord is a man of war” (Exodus 15:3). War is also a Heaven-sent penalty for the sins due to unbelief. The Almighty once threatened just before he sent a major war, “I will punish the world for its evil, and the wicked for their iniquity” (Isaiah 13:11). So be clear on this! Not by chance, nor by destiny, but by violating his high and holy law will God rain down war upon a country. This is a set spiritual rule of cause and effect. Note this! Think about it! In God you live, move, and exist (Acts 17:28). Yet what has America done? The hate-Christ groups have kicked God out of every public building, and, along with the majority of citizens, have kicked out the true God wherever he is found in American life, and have replaced him with sports, the pursuit of money, and a thousand other, selfish substitutes. Is this not true? Ask an impartial observer! Ask a foreigner! Ask an immigrant what it is that his American coworkers will teach him first! Will he not reply that it will be how to swear in English by using the name of Jesus Christ, the Savior of the human race and true God? Open up your eyes, America! Look at what you have done! So what does the Almighty threaten to do to any and to every nation as a result of such unbelief? “All nations that forget God will be turned into hell” (Psalm 9:17). Again, what has the true God done? He has come to this country in the past, offering it mercy instead of damnation. He has asked it to humble itself, to be sorry for its sins, and to trust in Heaven’s promise of forgiveness through the special efforts of its God and Savior, Jesus Christ. Yet how has this land responded to such surpassing pardon? This people has thought of his mercy as chains and as shackles of which they are only too glad to be rid (Psalm 107:14). Americans have rejected God’s salvation along with its assurances that alone could calm the cries of their agonized souls. They have pushed aside his moral code of love and of peace, and have plunged themselves into sin. Consequently, the written record of God’s will, the Bible, threatens with this unbreakable pledge, “The nation and kingdom that will not serve you will perish; yes, those nations will be laid waste completely” (Isaiah 60:12). As long as Americans wage war on the Lord by passing laws against his will, by ridiculing his biblical morality, and by rejecting his gospel plan, they are daring the Almighty to fulfill his threat to annihilate them through war. Do not be fooled! God will not be mocked. How long will it take before you would see this? Be certain that the Creator of the heavens and the earth will punish with a war! Learn this lesson! Understand also that even though God has not immediately sent this war, you could and should not conclude that he will not send it. Take the example of frostbite! As with frostbite the person does not feel the agonizing consequences of his foolish behavior immediately, but only afterwards, so with God’s punishments on godless behavior the agonizing consequences do not occur immediately, but follow later. Could you not see this? Why punish this country? Why does not God punish a country that deserves it, such as a barbaric country? Just look at the sins of this land, and see how it wars against Heaven! Many women today demand fiercely to have and to keep the right to butcher unborn babies in the womb, tearing their little bodies to shreds so that the mother could pursue selfishness. Is this mercy or madness? Moreover, realize that this is not being done in a backward, barbaric country, but by one of the most highly cultured and civilized nations in the world. Even animals show more regard for the fruit of their womb. In other words, self-deceived women, driven by craven selfishness, have pursued a slaughter of unborn infants to the toll of over a million souls a year. Yet instead of protecting the weak and the helpless (Proverbs 31:8-9; Matthew 5:5, 7, & 9) unborn, tyrants in the White House, on the Supreme Court, and in the Congress have deserted their duty. For reasons of more power, they have plainly encouraged this spilling of blood. On top of all this, the majority of voters stands by silently, and does nothing to stop it. Year after year the butchering goes on with no reprieve in sight. For all of this the Almighty will punish the United States furiously for its merciless cruelty and oppression. Are you ever going to open your eyes, America? Could you not see the propaganda issuing from godless Washington, the godless intelligentsia, and the godless media which calls evil “good,” and good “evil” (Isaiah 5:20); that is, which calls lawlessness, such as, abortion, “good,’ and godly morals “evil”? As if this were not enough, observe the other crimes of our country as well: the media which pounces on a human tragedy to profit from other peoples’ misery; the entertainment industry that panders to man’s vile nature, filling his heart with thoughts of lust simply to make millions for itself; the pressure groups, who, instead of building this nation up with a national righteousness (Proverbs 14:34), threaten to get what they want, and, consequently, tear society apart, splitting the segments into enemies; the contemptible tyrants in the nation’s capital and in the state houses of our several states, who, instead of being statesmen, abuse their trust by lying to the voters to get power, and then, to increase their power, take away from the private citizen his God-given liberties one by one, and thereby subject the citizen to a new, 21st century slavery and tyranny; the arrogant, so-called intelligentsia of this land, who waste their intellect by denying the Creator of it, and who refuse to teach that selfishness is the cause of our ills, but who urge society to embrace evil; the advertisers and the merchandisers, who hound the American public relentlessly to spend their all on worldly objects, and give them no rest to seek out God; the worldly preachers in the United States, who bastardize the gospel and preach worldliness to their smug listeners, sending them to hell; the unconcerned citizens themselves, who live with a “Me first!” attitude, cheating and deceiving their neighbors and employers with no concern for the coming Judgment Day and eternal damnation! Open your eyes, and look at what you have done! What made you think that God would never notice? Understand the fact that only because Americans have followed Christianity in the past has this country been blessed! Why do you think that the United States has continuously received larger and more numerous blessings than any other nation? Listen to this answer from former President Rocca of Argentina, “The immense superiority of North America came from the Bible, while the South American invaders placed their faith in force and violence”! Our early colonists and leaders put their trust in the book of the Bible where God speaks to you. They trusted his promises and followed his guidance. As a result, what happened? This land became strong, blessed, and admired. Why? It was not because America was superior, but in spite of their many failings and weaknesses, God lifted this land up and blessed it out of the grace of his great heart according to his pledge (Psalm 29:11). Realize, also, that essentially, there are only two religions in the world: Christianity and all others! While religion to the non-Christian means that man must do something to please God, religion to the Christian means the opposite. The Heaven-sent, Christian religion means that God has promised his love and forgiveness to sinners because of the pleasing works of Christ. Which is the true religion? It is Christianity. Basically, Christianity is this: it is the promise that God holds out to rebellious and sinful mankind. It is the promise that intervenes and keeps you from being damned on Judgment Day, and sent to never-ending torment. It is the pledge that heaven has now been opened for all because of the work of Jesus Christ, your God. It is an assurance that he underwent the punishment which you, the sinner, deserved. That is, he served your sentence, hell’s torment, for you. It is God’s guaranty that, as a result, Christ made amends for you. Moreover, this power-filled promise contains divine might that is designed to turn you back to God by causing you to trust in this very promise, and thereby, to bring you into Christianity. Christianity is based on God’s gospel promise, and those who hold to Christianity live through God’s promise. Therefore, grab onto God’s gospel promise of an open heaven! It is meant for you, too. Believe it, and live! To be sure, only Christianity has God’s saving power and God’s personal pledge. All other religions are a hellish sham. Indeed, Christ’s command in Matthew 28:29 orders Christianity not merely to oppose, but to displace all other religions, thereby denying them the divine right to exist; for the one, true God has commanded that Christianity is “to open up their eyes [of the Jews and of the heathen] so that they may turn from darkness to light, and from the power of Satan to that of God; so that they may receive forgiveness of sins and the inheritance among those that have been sanctified by faith that is in” Christ (Acts 26:28). See how closely the early Americans clung to Christ and to his saving blood! For example, what is chiseled on the wall of George Washington’s tomb? It is this gospel promise of Christ which Washington took to heart, namely, “I am the resurrection and the life. He that believeth in me, though he were dead, yet shall he live” (John 11:25). Formerly, even educators and the presidents of United States universities have praised Christ, giving his salvation the highest priority. For instance, hear the words of Henry Wade Rogers, former president of Northwestern University: “I heartily accept the Bible as the Word of God and sincerely believe in Jesus Christ as the Savior of man”! Cyrus Northrop, the second president of the University of Minnesota, declared, “The Bible is the Guide Book to heaven showing us the way, Christ is the Way. ‘No man cometh unto the Father, but by’ Him” [John 14:6.] Thus, in the past, America had not only common citizens, but leaders and educators, as well, who sincerely followed the Lord. In fact, it could be seen why America has been so blessed in the past. This nation was not established on the crescent of Islam, nor on the Jewish star of David, but on the cross of Christ. That was then. Where are such confessions of Christ today? Things have changed. America as a whole has left the Lord in an all-out, away-from-Christ movement. Even though the Lord has pleaded, “Return to me, and I will return to you” (Malachi 3:7), the overwhelming majority in this land has turned its heart away from Christ. Just the same, could not the Lord have done something in the past to stir the United States out of its extreme backsliding? He did. He warned America against its pride with the humbling, military casualties of the First World War, and then, in the years following, with an epidemic of Spanish influenza among the civilian population, as well. Nevertheless, as a whole society showed its lack of remorse by indulging in the Roaring Twenties, not by a repentance and a return to the Lord. After this the Lord brought on the Great Depression of the 1930’s. Again, this did not turn the country back to God. So before it backslid any further, the Almighty afflicted America with yet another World War, and then, after it, with polio epidemics among the civilian population, as well. During these decades of the 1930’s and 1940’s, one of the most widely heard voices on the radio, Walter A. Maier of the Lutheran Hour, called on this land to turn from its worldliness and evil, and to return to the faith of its fathers in Christ. Yet there was no noticeable repentance and return to the Lord, for the United States would not be stopped on its spiritual slide downward. Thus the gospel golden age which God had started in the heartland of this country in the 1840’s, and which rose and prospered under his hand for a hundred years, was rejected and discarded for the lusts of the flesh, despite all attempts of the Almighty to turn it around. What does Heaven have to do to get this nation’s attention? For this deliberate rejection, and for further cruel sins of the flesh, America must now pay the terrible price. This is the timeless, biblical threat set in stone. Stop, and think about that, America! Even recently, the Lord has blessed the United States economically to demonstrate how good he is; to move this land to turn back to him in repentance and faith in his forgiveness, and to be confident of his good treatment. Yet how has this people responded? It has done so by rejecting and replacing him with self-serving substitutes. Since this country continues to be prideful and arrogant; since it refuses to humble itself before its Maker (2nd Chronicles 7:14), and, instead, has thrown out the Lord, and has gloried in a life without his mercy, the mighty God will respond, and will humiliate this land. As when the outer boards from an old structure are torn away, revealing rottenness, releasing the stench of decay, and giving a startling glimpse of disgusting creatures, scurrying to get away from the brightness of the exposure, so the Almighty will tear the deceitful mask off of this country’s painted face to reveal the underlying rottenness and decay of this land’s pride-filled inhabitants to their open shame, and to the laughter of the world. Why have you not seen this, America? More to the point: Why have you forgotten God, and why did you ever think that you could get away with it? Why have you, for instance, substituted the birth date of the Savior from sin with a Santa, replaced his resurrection commemoration with an Easter bunny, and set up a pagan festival in opposition to the Reformation anniversary, calling it “Halloween”? What made you think that you could do this, and never pay the price? In the Midwest, deer hunters will construct stands in the trees from which they could hunt, for deer do not look upward. Just so, because America does not look upward to Heaven, it will go down to sudden, unexpected destruction. A devastating war will come; period. There is no use in arguing about this. Wake up to this fact, America! The question, then, facing you, American citizen, is this: “Are you making a deliberate, calculated effort to repent before God, to admit your evil, and to return to him by resting on his promise of pardon?” Do so! There is no time to lose. In 1775, in the early months of the American War for Independence, George Washington had six warships readied at his own expense. The flag that flew over this fleet was that of an evergreen tree on a white background with the words “An Appeal to Heaven.” It was Washington’s pious reminder to the crews that only God’s blessing could help the American states. 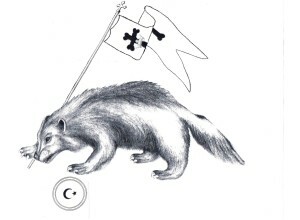 Where is such a flag today? Why is this truth not in the hearts of Americans? Realize that if you would reject Heaven, the Almighty will remove his blessing, and reject you! Why let this happen? Quit your selfishness! Be sorry for your sins! Turn from them to the Lord’s mercy! Trust in that from now on, and build a national righteousness that will keep this nation from becoming one large burnt cinder, so that our land could and should survive to serve the Lord in repentant living! This is what God would have you do. In other words, you, the American citizen, should be a true Christian, and follow the true gospel! You should leave, after protesting and scolding, those modern churches which have changed the gospel by their man-made teachings, and then, return to and hold on to the authentic gospel, the one on which our nation established itself! Currently, there are many gospel substitutes. Which is the true gospel? The true gospel is the one taught in a clear, simple manner by the Bible itself. Briefly, it is this: the true God was angry with the world over its sinful state, but God laid his anger by, and declared the whole world to be righteous, thus opening heaven to everyone to live with him. God was persuaded to accomplish this kindness, not by acts of man, but simply by the grace of his heart. Yet did not rebellious, law-breaking mankind deserve to be punished? Yes, it did. However, to spare the world for heaven, and not to send it to hell, God put forth a substitute, and punished him instead. Who was this substitute? God’s dearest treasure: his Son, Jesus Christ. Now the world is freed from damnation, and is promised an open heaven to enter after this life. If any person would believe this promise after coming under its powerful sway – and God wants him to believe it – he will possess the eternal life which the Lord has readied for him. If he were to reject God’s promise, he would lose heaven, and be left with damnation. The United States Supreme Court has handed down this verdict: If a prisoner would refuse a pardon, he will stay condemned. It is the same with God’s verdict. This is the great, glorious gospel. This is why America has been urged to repent, and to believe the gospel. See the following, biblical passages! They deny ”the Lord who bought them, and bring on themselves swift destruction” (1st Peter 2:1). God “has reconciled us to himself through Jesus Christ, and has given us the ministry of reconciliation, that is, that God was in Christ reconciling the world to himself, not charging them with their trespasses. For he made him who knew no sin to be sin for us, in order that we might be made the righteousness of God in him” (2nd Corinthians 5:18, 19, & 21). “If when we were enemies we were reconciled to God by the death of his son, much more then, having been reconciled, we will be saved by his life” (Romans 5:10). Jesus “delivers us from the wrath to come” (1st Thessalonians 1:10). “He who would hear my Word and believe in him who sent me, will have everlasting life, and will not come into judgment, but will have passed from death into life” (John 5:24). “Faith comes by the gospel report” (Romans 10:17). “By grace are you saved through faith, and that not of yourselves, it is the gift of God, not of works, lest anyone should boast” (Ephesians 2:8-9). “We see Jesus, who was made a little lower than the angels, for the suffering of death, crowned with glory and honor, that he, by the grace of God, might taste death for everyone” (Hebrews 2:9). “He himself is the satisfaction for our sins, and not for ours only but also for the whole world” (1st John 2:2). “Where I am, there my servant will be also” (John 12:26). “This is life eternal: that they may know you, the only true God, and Jesus Christ whom you have sent” (John 17:3). This is the gospel on which our country was established. This is the same gospel that Martin Luther restored to the modern world. Grasp the fact, therefore, that this nation was not established in the spirit of the Roman Catholic Spaniard Melendez, who, after he had wiped out the first Protestant settlement in North America at Fort Caroline, Florida, in 1565, consisting of Ribault and his men, declared that he hanged them, “not because they were Frenchmen, but because they were Lutherans”! Rather, see that it was “the [Lutheran] Swedes on the Delaware [that] had more to do with the genuine molding of American history than had the Pilgrim Fathers of New England. With these early colonists, liberty of conscience was a historical fact, and not a mockery or a myth, as with the Pilgrim Fathers of New England. They laid the foundation for the success of William Penn’s ‘Holy Experiment’ before this great man was born. At a later day the migration from Pennsylvania into the valleys of the Ohio and Mississippi and to the West spread the Delaware and Pennsylvania influence throughout these regions. Well for all of us that ‘America did not come out of New England’ (Woodrow Wilson). Well for all of us that America did not take on the stamp of the bigotry and intolerance of the witch-hanging and Quaker-hanging Pilgrim Fathers. Let us be truly thankful that there were ‘other rocks’ than Plymouth Rock” (C. Hale Sipe, a Pennsylvania lawyer and historian). Basically, Americanism means the guaranteed liberties of speech, of assembly, of equality, and of religious freedom, based on a constitutional republic. Lutheranism does not conflict with this. It teaches the separate domains of church and of state. The Reformed denominations, meanwhile, would have to change their confessions in order to come into line with American principles, for they advocate passing civil laws favoring their beliefs. The same holds true for the Roman Catholic denomination. Lutheranism is not a distortion or a modification of Christianity. It is not Christianity plus some ideas of Luther. It is identical with Christianity, nothing more and nothing less. Lutheranism is simply the reformation, that is, the restoration of original Christianity. So go to this biblically based faith, and cling to it! How could things be set right in our nation? Could it be done by the armed overthrow of the tyrants in government – an idea advocated by Jefferson, by Lincoln, and by the state motto of Virginia which Booth shouted to the audience after he had shot Lincoln (“Thus may it ever be to tyrants”), but forbidden by the Bible (Romans 13)? Realize that if God would want to topple tyrants, he will strike them down himself! Meanwhile, they are yet another form of his punishment. Could things be set right by rallying the citizens to vote wisely, or by following the solutions of the think tanks? What is needed is not man’s solutions, but God’s. While even the highest and best minds could point out what the American citizen is doing wrongly, they could not effect a change in a single person, much less in the whole country. For the problem is with the evil-prone, human heart. Only God has the power to change this. Only God could penetrate deeply with the Words of his Bible (Hebrews 4:12). In addition, only God could bless or curse this nation, and since Heaven has not been appeased by a nation-wide repentance and gospel-trust movement back to Christ, this land will stay cursed and primed for further punishment. Consequently, ask Christ to set this land aright! In fact, where are the clergy? Why have they not done this? Why have not the ministers said anything about God’s punishment? As the wicked clergy in Jeremiah’s day would only preach, “Peace!” and “Prosperity!” (Jeremiah 6:14), so are the clergy acting today. Hence see the imperative and the propriety of the Bible’s verdict that “the time has come for judgment to begin at the house of God” (1st Peter 4:17)! Will America be annihilated by this War, or will it survive? According to the Lord’s unbreakable promise in 2nd Chronicles 7:14, if enough citizens would repent, even though they may not constitute the majority, the country will not be annihilated. The question, then, is: Will enough Americans repent? If enough would repent, America will survive; if not, then the United States will be laid waste. So what will happen? Could we know; and how could we be certain? The Bible, of course, is silent on America by name. Just the same, because of his great grace, and for the purposes of your preparedness and high comfort, the Lord of heaven has left you an assurance by which the American citizen could and should be certain that his country will not go out of existence, but will survive. What is this assurance? It is something that, from the Bible, we see that God does sparingly, but purposely, on occasion (Genesis 15:1 & 12-13; 41:15-32; Daniel 2:28-47). It is something by which God will inform a ruler about the destiny of his nation, the information of which the ruler normally could not know. That is to say, the Lord will give to a ruler a vision of the future. In this case, the Lord graciously gave to George Washington at Valley Forge a vision of the future of this country. It is in this vision that Washington is told of a great war that would come upon this country; a war in which the Republic would be pitted against all other nations, that is, against all flags; a war in which this land would not be annihilated, but, ultimately, would by God’s rescue, survive, and be victorious. This vision has been given in the Appendix. This vision showed George Washington that not only would there be a great war, but that two other wars would precede it. In other words, there would be three great crises that would come upon America, all of which would be in the form of a war, on which the survival of the Union itself would hang in the balance. These wars would be the War of Independence, the Civil War, and the coming great war. To be sure, during these first two wars there were precarious times in which the Republic was in danger of going out of existence as we know it today. Our country will face the same danger in the coming third great war. Just the same, in this latter war, as in the first two, God will see to it that, again, out of his great mercy, the Union will survive. Indeed, note the importance of the fact that there will be three crises. This is the unmistakable sign of the great God himself: the Father, Son, and Holy Spirit, the true and triune Lord of heaven. To purify the American Christian, and to make him trust more firmly in Heaven’s protection promises, yet, at the same time, to punish the unbeliever, and to bring him to his spiritual senses. In other words, let it be taught that God will cause America to win in the end! Why? Would it be because America is privileged; because the United States would be good at heart, or because its people would be strong and unconquerable? It will be so that God will be adored. God will take weak, outmatched America, array the whole world against it, and allow the world every means and opportunity to crush it. Yet God will spare America so that the remnant will adore him. Moreover, as you read Washington’s vision in the Appendix, observe that it is a divine vision, not a made-up one! A man is unable to make up a vision such as this. Man-made visions are trite and fall to the ground due to their internal absurdities. Indeed, their dreams forecast merely fleshly wishes of personal success, not of disasters, such as, of war and of punishment upon themselves. However, the vision given to Washington is different. It agrees with the biblical penalty of a great war to punish America for its rejection of God. It mentions the Revolutionary and the Civil Wars, which were similar, Republic-threatening crises. It is the sign of three – the true triune God. In addition, the imagery that is employed is astute, yet simple to understand; it is pithy and plausible, not presumptuous, nor plodding. While the effect of a man-fabricated vision would be to introduce a subject which would remain unexplained, mysterious, and confused, to the contrary, the specific purpose of the Heaven-sent vision will be to make the unknown, known, the unrevealed, revealed, and the unclear, clear by the use of comparisons or metaphors which are familiar to and could and should readily be understood by the reader. In addition, to have an angel (2nd Kings 19:35), or a host of them (2nd Kings 6:16-17), fight for a country according to God’s plan, is entirely biblical (Daniel 10). Likewise, whenever an angel appeared in human form, it was to bring a message to men, or to perform some service for men as a messenger of God’s providence (Genesis 18 & 19; Luke 24:4; Acts 1:10). What is more, though there is something that this vision does not mention, still it could and should be predicted with confidence. That is this: based on what was characteristic of the first two crises, indeed, what was fundamental to them, it could and should be taught and accepted that in the third great war to come upon this Republic, a similar thing will occur, namely, that a great military leader on the order of a Washington and of a U. S. Grant will be raised up by God to be used by him to be the saver of this Union. Thus Grant, not Lincoln, was the true saver of this country in the Civil War. So where does all of this leave the Christian in America? Understand that Heaven expects you to do the following! You are to ask the Almighty to hold off his impending punishment by praying for the peace of your land (Jeremiah 29:7), as Abraham pleaded (Genesis 18:23-31). In fact, if you would fail to do these things, the Almighty will hold you personally accountable for your country’s overthrow (Ezekiel 22:30-31). In addition, pray for your children’s children, and for more converts in the darker days ahead! Exhortation. Furthermore, do not despair over the coming of the great war which will thoroughly devastate this country; from which even the Christians will not escape! Rather, realize that God’s judgment must start with his own people (1st Peter 4:17)! Then, be mightily assured of the Lord’s precious promise to deliver his believers’ souls from every evil work, and to preserve them for his heavenly kingdom (2nd Timothy 4:18)! Take these mighty pledges to heart! They have been given to buoy your hopes even while facing the darkest of disasters. See the comfort of Washington’s vision in knowing that God will not annihilate this land, but will send his sure deliverance afterward! In fact, learn this lesson from Habakkuk! He and the few, remaining believers were informed of a similar calamity facing their own country. Yet in the face of such dire news Habakkuk could still rejoice in his Lord, for the Lord’s gospel assurance would steady his mind and buoy his soul even to the extent that he could proceed through the worst of calamities swift and sure, as a deer would leap through the woods (Habakkuk 3:18-19). Be as confident! Rely on the Redeemer also to lift you up, and to sustain you even through the worst of national crises, for he will not leave you comfortless! That is his high promise to you. Take it to heart! Say, “That promise includes me, too”! Once in your life on earth you stood before the mighty city of Jerusalem and cried. You cried because it had rejected you; its church had refused to accept you in repentance and faith; its unbelief, its obsession with worldliness, and the corruption of its worship, you knew, would tragically combine to call down Heaven’s fierce firestorm on this previously highly privileged city. So, today, you stand in spirit over America and cry. You cry because this highly privileged land has likewise rejected you. Its people repeatedly have refused to accept you in repentance and faith. It has rejected you so that its arms could be free instead to grasp every desire of its eyes. Tears pour down your cheeks because you know of the frightful punishment that is now awaiting America for its rejection of you with such coldness, callousness, and ferocity. Since past wars, droughts, and depressions have not impressed our citizens to humble themselves before you, one huge war must now be dropped on this country as a rock. As you weep, you wonder how America could be so senseless. Therefore, because you are a God of justice, and since such arrogance and unbelief must not go unpunished, may you help me to accept your righteous judgment with humbleness! Yet I know that you are also a God of mercy. So remember me according to your unbreakable, biblical promises! I am counting on you. Do not utterly destroy America, but after its severe punishment by war, come and heal it, that is, let it recover! For now, I will obey your biblical commands to humble myself, to confess and to ask forgiveness for the grievous sins of America, and to pray for the peace of this land from utter destruction. Just the same, bring many in America to repentance to stop this wholesale rejection of you! I plead this prayer relying only in the blood-bought mercies of you, my Lord Jesus Christ. Amen! A painting of George Washington based on an engraving made by John C. McRae which, in turn, was based on an original painting by Henry Brueckner. 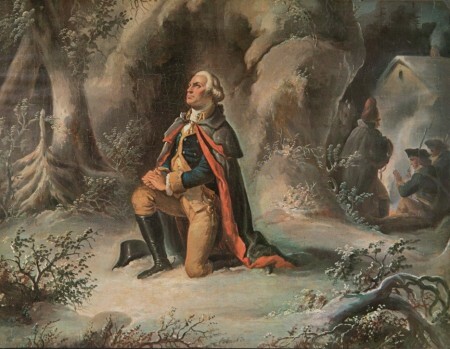 In the terrible winter at Valley Forge, Isaac Potts, out in the woods, heard a voice and, peering through the trees, saw Washington on his knees praying aloud to God for help and strength. The Quaker went home and told his wife that Washington would be successful in war for God would hear such prayers as those. “I do not know whether it is owing to the anxiety of my mind, or what, but this afternoon as I was sitting at this table engaged in preparing a dispatch, something seemed to disturb me. Looking up, I beheld standing opposite me a singularly beautiful female. So astonished was I, for I had given strict orders not to be disturbed, that it was some moments before I found language to inquire into the cause of her presence. A second, a third, and even a fourth time did I repeat my question, but received no answer from my mysterious visitor except a slight raising of her eyes. By this time I felt strange sensations spreading through me. I would have risen but the riveted gaze of the being before me rendered volition impossible. I assayed once more to address her, but my tongue had become useless. Even thought itself had become paralyzed. A new influence, mysterious, potent, irresistible, took possession of me. All I could do was to gaze steadily vacantly at my unknown visitant. Gradually the surrounding atmosphere seemed as though becoming filled [sic] with sensations, and luminous. Everything about me seemed to rarify, the mysterious visitor herself becoming more airy and yet more distinct to my sight than before. I now began to feel as one dying, or rather to experience the sensations which I have sometimes imagined accompany dissolution. I did not think, I did not reason, I did not move; all were alike impossible. I was only conscious of gazing fixedly, vacantly at my companion. “Presently I heard a voice saying, ‘Son of the Republic, look and learn’, while at the same time my visitor extended her arm eastwardly. I now beheld a heavy white vapor at some distance rising fold upon fold. This gradually dissipated, and I looked upon a strange scene. Before me lay spread out in one vast plain all the countries of the world – Europe, Asia, Africa, and America. I saw rolling and tossing between Europe and America the billows of the Atlantic, and between Asia and America lay the Pacific. ‘Son of the Republic’, said the same mysterious voice as before, ‘look and learn’. At that moment I beheld a dark, shadowy being, like an angel, standing, or rather floating in mid-air, between Europe and America. Dipping water out of the ocean in the hollow of each hand, he sprinkled some upon America with his right hand, while with his left hand he cast some on Europe. Immediately a cloud raised from these countries, and joined in mid-ocean. For awhile it remained stationary, and then moved slowly westward, until it enveloped America in its murky folds. Sharp flashes of lightning gleamed through it at intervals, and I heard the smothered groans and cries of the American people. A second time the angel dipped water from the ocean, and sprinkled it out as before. The dark cloud was then drawn back to the ocean, in whose heaving billows it sank from view. A third time I heard the mysterious voice saying, ‘Son of the Republic, look and learn’. I cast my eyes upon America and beheld villages and towns and cities springing up one after another until the whole land from the Atlantic to the Pacific was doted with them. Again, I heard the mysterious voice say, ‘Son of the Republic, the end of the century cometh, look and learn’. “At this the dark shadowy angel turned his face southward, and from Africa I saw an ill-omened spectre approach our land. It flitted slowly over every town and city of the latter. The inhabitants presently set themselves in battle array against each other. As I continued looking I saw a bright angel, on whose brow rested a crown of light, on which was traced the word ‘Union’, bearing the American flag which he placed between the divided nation, and said, ‘Remember ye are brethren’. Instantly, the inhabitants, casting away their weapons became friends once more, and united around the National Standard. “And again I heard the mysterious voice saying, ‘Son of the Republic, look and learn’. At this the dark, shadowy angel placed a trumpet to his mouth, and blew three distinct blasts; and taking water from the ocean, he sprinkled it upon Europe, Asia, and Africa. Then my eyes beheld a fearful scene: from each of these countries arose thick, black clouds that were soon joined into one. And throughout this mass there gleamed a dark red light by which I saw hordes of armed men, who, moving with the cloud, marched by land and sailed by sea to America, which country was enveloped in the volume of cloud. And I dimly saw these vast armies devastate the whole country and burn the villages, towns, and cities that I beheld springing up. As my ears listened to the thundering of the cannon, clashing of swords, and the shouts and cries of millions in mortal combat, I heard again the mysterious voice saying, ‘Son of the Republic, look and learn’. When the voice had ceased, the dark shadowy angel placed his trumpet once more to his mouth, and blew a long and fearful blast. “Instantly a light as of a thousand suns shone down from above me, and pierced and broke into fragments the dark cloud which enveloped America. At the same moment the angel upon whose head still shone the word ‘Union’, and who bore our national flag in one hand and a sword in the other, descended from the heavens attended by legions of white spirits. These immediately joined the inhabitants of America who I perceived were wellnigh overcome, but who immediately taking courage again, closed up their broken ranks and renewed the battle. Again, amid the fearful noise of the conflict, I heard the mysterious voice saying, ‘Son of the Republic, look and learn’. As the voice ceased, the shadowy angel for the last time dipped water from the ocean and sprinkled it upon America. Instantly the dark cloud rolled back, together with the armies it had brought, leaving the inhabitants of the land victorious. “Then once more I beheld the villages, town and cities springing up where I had seen them before, while the bright angel, planting the azure standard he had brought in the midst of them, cried with a loud voice: ‘While the stars remain, and the heavens send down dew upon the earth, so long shall the Union last’. And taking from his brow the crown on which blazoned the word ‘Union’, he placed it upon the Standard while the people, kneeling down, said, ‘Amen’. “The scene instantly began to fade and dissolve, and I at last saw nothing but the rising, curling vapor I at first beheld. This also disappearing, I found myself once more gazing upon the mysterious visitor, who in the same voice I had heard before, said, ‘Son of the Republic, what you have seen is thus interpreted: three great perils will come upon the Republic. The most fearful is the third passing which the whole world united shall not prevail against her. Let every child of the Republic learn to live for his God, his land and Union’. With these words the vision vanished, and I started from my seat and felt that I have seen a vision wherein had been shown to me the birth, progress, and destiny of the United States” (Anthony Sherman, Words of Life: George Washington’s Vision [1880: Christian Workers Union, Inc.]; note:originally published by Wesley Bradshaw; copied from a reprint in the National Tribune, Vol. 4, No. 12, December 1880; on microfilm at the Sterling Library, Yale University, in New Haven, Connecticut). Found in North America, the wolverine has this distinctive feature: upon meeting another, it will attack. It will not retreat. It will not waver. It always will attack. The only way that the American people could and should survive annihilation and stand victorious over their Muslim foes (Revelation 9:13-19) would be never to retreat, never to waver, but always to march under the courage-giving, strength-sending gospel banner of Christ’s victorious resurrection, treading down the power of their Islamic oppressors by preaching far and wide the gospel report. The following is for the eyes of the rest of the world only. Realize, therefore, nations of the world, that the true God of the heavens and earth has raised up another flag over America! This one displays the form of a wolverine; that is all. Yet the message is plain: “Do not attack America! If you would attack, you will be bloodied, for the wolverine, found in North America, has this fierce feature: it will attack. Should it meet an opponent, it will attack. It will not pass by him. It will not run away. It will always attack. Thus, nations of the world, if you would assemble your armies, invade American shores, and burn its cities from coast to coast, the Almighty will, in his time, raise up a people and empower them with his might to repel you with a wolverine-like fierceness. Leave America alone! You have been warned. Repent! Make peace with God through the pardon-bringing blood of the Lord Jesus Christ!